What is Microbiome Search Engine? Microbiome Search Engine is a search-able database of microbiome for in-depth data mining of microbial community studies by data integration and data selection. It contains large scale of microbial community samples with sequences, meta-data and analysis results. Based on the query sample(s), Microbiome Search Engine will provide the matched entry sample(s) in the database with very similar community structures in an ultra-fast speed. 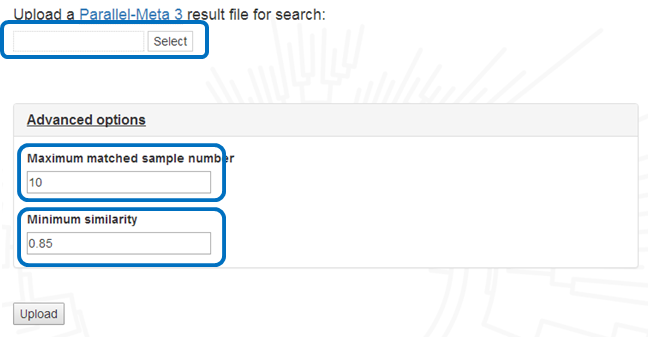 In addition, samples in the database can also be sorted, selected, exported and downloaded by their sampling meta-data information (meta-data). 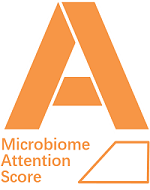 This reference microbiome database is being constantly updated and will be released periodically. How to pre-process your query sample? Then in the output directory "sample1.out", the parsed taxonomy result file "classification.txt" is qualified for upload and search.This file contains two columns: the OTUs (greengene 13-8 on 97% level) and their sequence numbers. How to upload your query sample? Minimum similarity:The min similarity value between input query and matched sample(s), default is 0.85. The similarity varies from 0.0-1.0, and higher similarity indicates more community structure shared by 2 samples. How to understand your query matches? The similarity between the query sample and the matched samples is calculated by Meta-Storms2, which incorporated both the relative abundance of each individual organism and the phylogeny architecture among organisms in the community on OTU level. The similarity varies from 0.0-1.0, and higher similarity indicates more community structure shared by the samples. Then the shared community structure of your input query sample and the matched samples (s) can be illustrated in a bar chart on phylum level and displayed in the result page. In addition, the searching results can also be downloaded with full community information including OTU table and Multi-Sample-View1, which could be further analysed in Parallel-META 31. How to understand MNS, MAS and MFI? How to download the database? 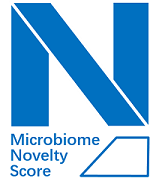 The Microbiome Search Engine online system also provides the complete database scores and meta-data, the search engine kernel standalone software (Meta-Storms 2) and the sequence profiling software (Parallel-META 3) in Download.